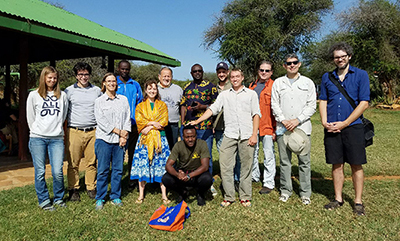 UF and Mpala Research Center collaboration team during the June 15-30, 2018 trip. Image: Cheryl Palm. Laikipia County rests in the heart of Kenya, beneath the second tallest mountain in Africa to the southeast and the Great Rift Valley to the west. Its resilient, semi-arid savannah is home to vast iconic wildlife including the “Big Five” (lion, leopard, rhinoceros, elephant, buffalo) and the threatened Grevy Zebra, Reticulated Giraffe, and White Rhinoceros. Stress has increased in the water-dependent ecosystem of Sub-Saharan Africa due to climatic changes, population increases, and the growing disparity between supply and demand for natural resources. 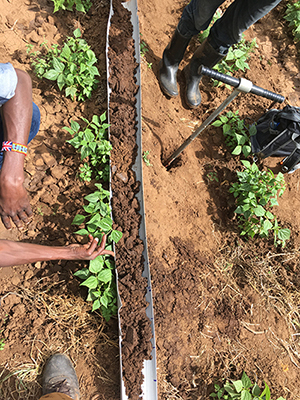 Smallholder farms along the Northern reaches of the Ewaso Ng’iro River are expanding, threatening the environment through unsustainable practices. Yet, these farmers’ livelihoods are under threat as well. This summer Dino Martins, the director of the Mpala Research Center in Laikipia County, invited University of Florida faculty and students to collaborate on agriculture projects in the semi-arid lands of Naibor in Laikipia, Kenya, taking advantage of UF’s notability with extension and Mpala’s research facilities, which traditionally have been geared towards conservation and wildlife research. This was headed by Cheryl Palm1,2 and was constituted of a team of five faculty(b) (Pedro Sanchez1,2, Rafael Muñoz-Carpena1, Patrick Mutuo2,3, Greg Kiker1, Gabriel Maltais-Landry2), two graduate students (Enrique Orozco López1(c), Julio C. Pachón2), and five undergraduate students (Victoria Steinnecker1(a), David Mubiro5(d), Joseph Omagwa6, Sienna Turner4(a), Ethan Weinrich2(a)). 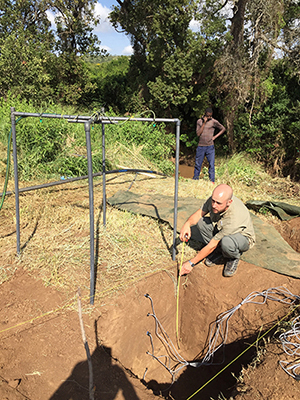 Graduate student Julio Pachón looking into a 2 meter soil profile to investigate vertical variations in texture and aggregation in farms along the Nanyuki River. Image: Julio Pachón. 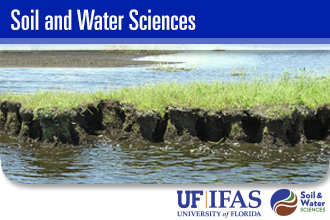 Enrique studied the potential use of vegetation buffers to protect the river water quality and the effect that soil macropores (i.e., like those from root, worms and other cracks in the soil) can have on water movement across the riparian buffer, and Julio estimated soil aggregation and particle size distribution changes along farms on the Ewaso Ng’iro, key properties in the physical fertility and soil conservation. 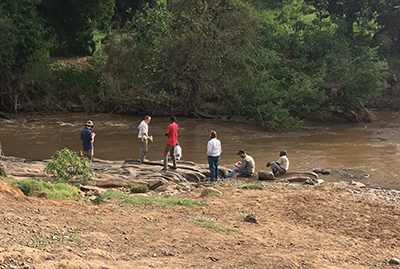 Victoria measured the water quality of tributaries to the Ewaso Ng’iro River, Sienna and Joseph examined pests, and Ethan and David looked into plant and soil nutrients. 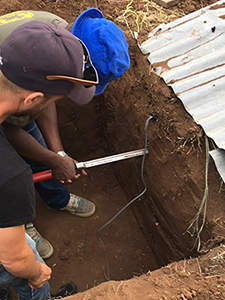 Surveys with local small-scale farmers set a baseline of understanding for local agricultural practices. 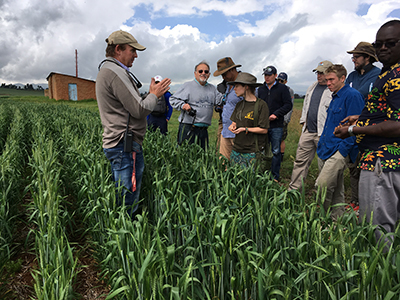 Additionally, the team spent a week on a workshop during which it explored possible partnerships with established researchers, notably Dr. Kelly Caylor, UCSB, as well as agricultural production at large scale located closer to Mt. Kenya. 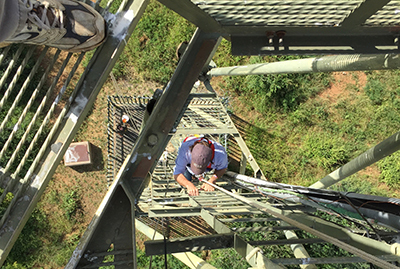 The data collected is a baseline for future projects in this collaboration between UF and Mpala. Furthermore, data on soil and water quality, along with interpretations, were shared with the participating farmers who appreciated obtaining information about their fields and recommendations to improve crop productivity and increase financial results from nutrient applications. 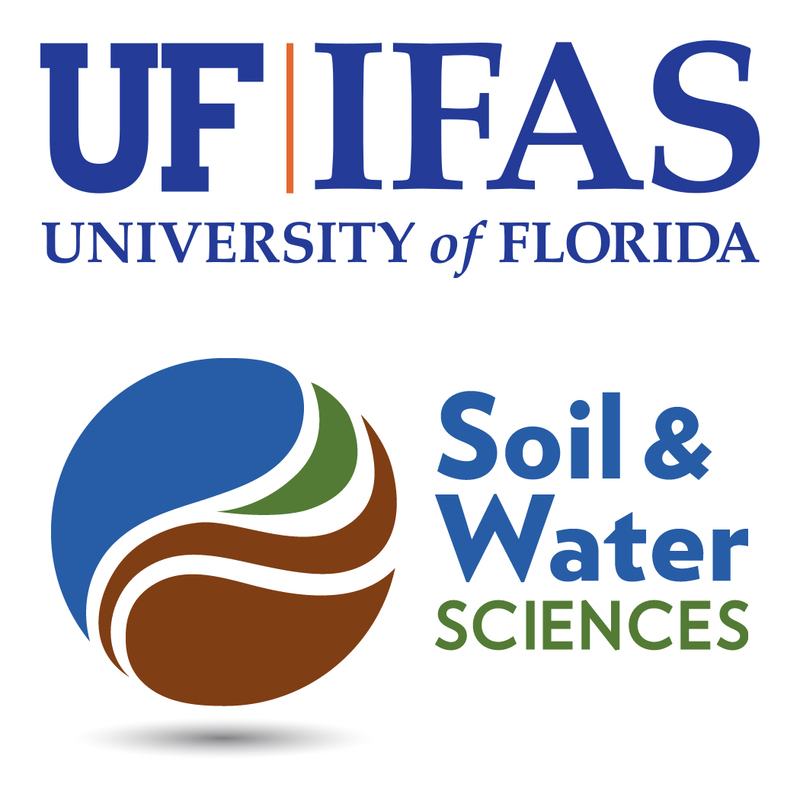 This initial research characterized the conditions of the farms and surrounding environments (natural capital: climate, soils, vegetation, water) through records, field, and lab measurements, and described agricultural practices (crops, tillage practices, irrigation, nutrient, and pesticide application rates and types) through farm surveys and observations. The team will now move on to use this information to develop more detailed research projects that will address improved agricultural practices for a sustainable environment and better the livelihoods of people in Naibor that can be extended to similar semi-arid Sub-Saharan ecosystems. Acknowledgments: We would like to thank the staff at Mpala Research Center for their kind hosting, as well as all the farmers in the region who opened their farms for our research.